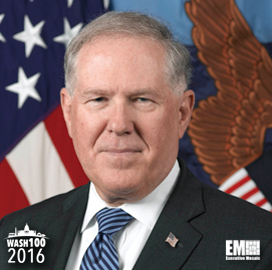 Executive Mosaic is honored to introduce Defense Department acquisition chief Frank Kendall as an inductee into the 2016 edition of the Wash100 — Executive Mosaic’s annual selection of influential leaders in the government contracting arena. Kendall received Senate confirmation as defense undersecretary for acquisition, technology and logistics in May 2012 and is the military’s top civilian official for matters such as acquisitions, research and engineering, contract administration and the defense industrial base. He served as principal deputy AT&L undersecretary and acting AT&L undersecretary from March 2010 to May 2012 and has led efforts to transform the military’s acquisition practices. In April 2015, Kendall and Deputy Defense Secretary Robert Work unveiled the third iteration of DoD’s Better Buying Power initiative that includes goals for collaboration with the private sector on technology research-and-development. He also singled out sequestration’s impact on procurement efforts in a September 2013 speech to the Professional Services Council and said DoD has not recovered from those mandated budget cuts. Lockheed Martin‘s $9 billion acquisition of Sikorsky Aircraft in late 2015 was the defense sector’s largest M&A deal that year and Kendall subsequently broached upon the idea of potential legal tools to slow down what he referred to as “excessive” consolidation in the defense sector. At the time, Kendall said his comments were not pointed specifically toward the Lockheed-Sikorsky deal but more at what he called the “general situation” of sector consolidation. “The trend toward fewer and larger prime contractors has the potential to affect innovation; limit the supply base; pose entry barriers to small, medium and large businesses; and ultimately reduce competition,” he said in a statement. Executive Mosaic congratulates Frank Kendall and the DoD team for their selection to receive this award.